A bank of front- and rear-mounted LEDs illuminates the road while three 26-inch mountain bike tires round out the package. The ELF only has one seat, but the rear cargo compartment can handle about eight grocery bags, according to the crew at OT. Propulsion comes from a 750-watt neodymium magnet motor, which gets its power from an 8-pound, 88.8-volt lithium-ion battery pack. OT says the ELF charges from a standard 110-volt outlet, and goes from empty to full in about two hours. That’s good for about 30 miles per charge, but if that’s not enough to get you back from the locavore, all-vegan co-op, a set of pedals are ready and waiting. If it’s a sunny day, park the thing in some sunshine and the battery will go even further – on the roof, there’s a 60-watt photovoltaic panel that sends a charge to the battery, but it only works when the ELF isn’t in motion. Solar and pedal -- two unlimited resources derived from the sun and you. 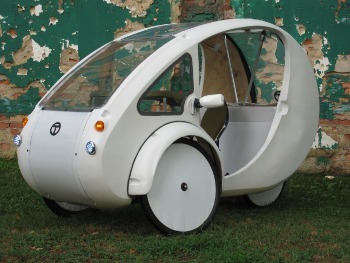 "The ELF is a solar/pedal hybrid vehicle suitable for commuting, deliveries, and other local transportation needs. 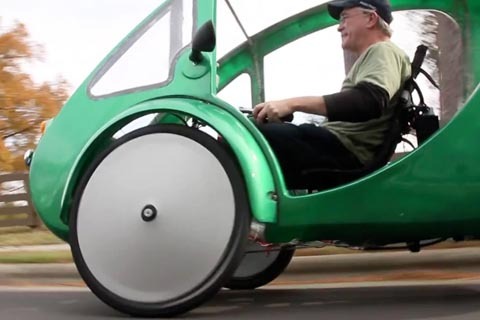 This three-wheeled electric assist velomobile fills the niche between a bicycle and a car and offers advantages over both."